Last Wednesday, I dropped by my usual local comic shop for my weekly fix. 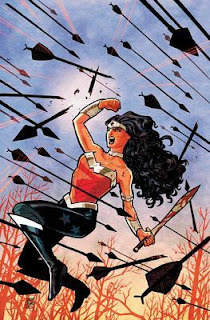 Amidst my mostly-Marvel pile, there was a single issue from DC: Wonder Woman #614. The guy behind the counter mentioned he was a huge Wonder Woman fan and he asked how I had enjoyed the "new" Wonder Woman. I told him that I thought it started strong and that it had my interest initially, but by the end I could summarize my reaction up in one word: huh? Obviously that isn't a knock against the character as a whole. This was clearly just a story that didn't work out for me. It started out with a fresh, interesting take on the character that just sort of disintegrated into something vaguely existential. In theory, the journey of a person trying to figure out who she is would be a fantastic story for a new reader to pick up. They can go on that journey with the character and make those discoveries right along side her. This, unfortunately, fails when it starts getting just plain confusing. I would elaborate on the points I didn't quite understand, but it's all a bit too foggy now. In fact, I should probably give the thing a reread just to get the whole story at once and see if it works any better. Should I try this again? This is obviously another logical jumping on point. 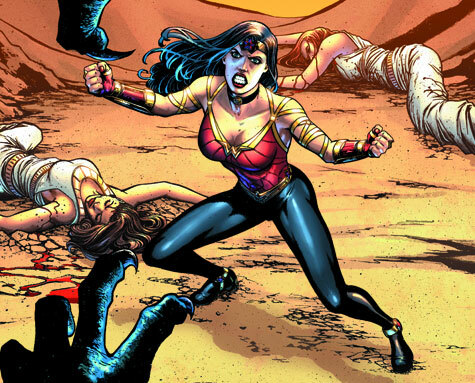 I desperately want to read and enjoy Wonder Woman, if only as a matter of principle. I have always been a very character-driven reader. If I get attached to a character, I will stick by her through thick and thin, good story or bad story, great art or stick figures. It's very difficult to get me to give up. So, if this reboot can actually let me get to know and like her (not that I didn't like her on the last round, I was just a bit confused), it could work out for me. Writer Tim Callahan even tweeted that it was the best title of The New 52. If it's genuinely that good, I might even forgive the fact that they removed my favorite part of the new costume - the criss-crossing arm straps that gave it a vague hint of Ancient Greece. The flip side of it is, I know my Marvel. I love my Marvel. I'm stubborn. Should I continue trying to make myself like DC and Wonder Woman just out of principle, or should I just stick with what I like and be happy with it? I often say I'll pick up the first issue of anything. I guess we'll see. Should I try any of the other new DC titles? Batwoman? JLA? Can my bank account survive this? Stay tuned for answers to these and other earth-shattering questions.